Pulse wave velocity (PWV) measurement assesses arterial stiffness by a tonometry-based system that measures the speed with which arterial pressure wave travels along the arterial tree, typically approximating the time that it takes this wave to travel from the descending aorta (using the carotid artery as a surrogate) to the femoral artery. Carotid-femoral PWV increases two- to threefold across the adult lifespan. David, M., Malti, O., AlGhatrif, M., Wright, J., Canepa, M., Strait, J. B. Pulse Wave Velocity Testing in the Baltimore Longitudinal Study of Aging. J. Vis. Exp. (84), e50817, doi:10.3791/50817 (2014). Carotid-femoral pulse wave velocity is considered the gold standard for measurements of central arterial stiffness obtained through noninvasive methods1. Subjects are placed in the supine position and allowed to rest quietly for at least 10 min prior to the start of the exam. The proper cuff size is selected and a blood pressure is obtained using an oscillometric device. Once a resting blood pressure has been obtained, pressure waveforms are acquired from the right femoral and right common carotid arteries. The system then automatically calculates the pulse transit time between these two sites (using the carotid artery as a surrogate for the descending aorta). Body surface measurements are used to determine the distance traveled by the pulse wave between the two sampling sites. This distance is then divided by the pulse transit time resulting in the pulse wave velocity. The measurements are performed in triplicate and the average is used for analysis. Pulse Wave Velocity (PWV) is regarded as the gold standard in the assessment of arterial stiffness2. While not used clinically in the United States, it has been validated and widely used in clinical settings throughout Europe3. Changes in PWV have been correlated with cardiovascular risk factors such as hypertension, obesity, impaired glucose tolerance, and dyslipidemia. Higher aortic stiffness has been associated with increased risk for a first cardiovascular event4, muscle mass decline5, and slower gait speed in subjects with peripheral arterial disease6. Assessment of PWV is accomplished by analyzing the speed with which a pulse of blood travels from the carotid artery to the femoral artery7. It is a relatively simple method with highly reproducible results. Advances in technology continue to simplify the procedure, reducing operator dependency and decreasing the amount of time required for the exam. The system used in our laboratory is produced by SphygmoCorand utilizes an EKG and a high-fidelity tonometer to acquire waveforms from the carotid and femoral pulses. The software then analyzes these variables to determine the velocity by 1) estimating the time that the pulse wave takes to travel between the carotid and femoral sites by referencing the timing of the pressure wave arrival at each arterial site relative to the electrocardiographic waveforms 2) dividing the measured distance between the two sites by the estimated time. The closer together the sampling sites, the less accurate the PWV, limiting the use of this method to larger vessels such as the femoral and carotid arteries. In addition to determining PWV, the system can calculate the pressure in the ascending aorta by applying a transfer function to the waveform produced by the radial pulse8 which is the "central pressure" and the pressure that most directly impacts the heart at time of ejection. This information can aid in the assessment of the arterial system's effect on the left ventricle in a reliable and noninvasive manner9. Alternative techniques used for the examination of vascular stiffness, such as carotid distensibility via echo tracking, require a great deal of technical expertise and are more time consuming than the PWV. Echo tracking also generally utilizes video-image analysis and therefore the accuracy of these measurements are limited3. Other techniques for examining vascular changes include assessment of carotid-intima medial thickness (IMT) which provides results more closely related to atherosclerotic progression although the cross-sectional and transverse images obtained can provide a crude approximation of carotid elastance. This method, however, is plagued by some of the same constraints as the distensibility studies described above. As researchers continue to look at the role arterial stiffness plays in various disease states, PWV measurement will likely continue to provide a quantitative and reproducible surrogate endpoint. Open the software via the shortcut on your Windows desktop by double-clicking on the icon. Click Patient to activate the Patient Screen. To enter a new patient into the database, click the New button in the patient search area, and then click on the Yes button to confirm you would like to enter a new patient. Enter patient details such as last name, first name, date of birth, and gender. Click on the Save button to advance to the next step. Click the PWA or PWV button to perform measurement. If only one of these modes is available, there is no need to click on the button, simply proceed to the study screen. Click on the Study button to enter study parameters. Enter the brachial pressure taken from a calibrated sphygmomanometer and any other details you wish to include. Click on the Capture Data button to proceed with a measurement. Attach the three ECG electrodes and leads to the patient in a modified Lead II configuration or using the patient's limbs as indicated on the cables. Palpate the patient's radial artery. This is located on the lateral of the wrist, immediately above the wrist joint near the base of the thumb. Gently press the radial artery against the underlying bone with the middle and index fingers. Place the tonometer over the strongest pulse point. Gently press the tonometer down until you see a consistent pressure waveform displayed on the data capture screen. If Auto Capture is enabled (see Note below), the system will automatically save the measurement. To manually save the measurement for analysis, press the spacebar on your keyboard (or step on the footswitch, if used). If a repeat measurement is required with the same study parameters, click on the Repeat button to return to the Capture Data screen and repeat the measurement as outlined in steps 2.4-2.5 above. To perform a measurement on a new patient, click on the Patient button and return to step 1.3 above. Click on the Study button to enter study parameters. Click on the Capture button to proceed with the measurement. Ensure the ECG signal is of acceptable quality. Palpate the carotid artery pulse. This is located between the larynx and the sternocleidomastoid muscle in the neck. It can be felt by pushing the muscle to the side and pressing the artery against the larynx. Place the tonometer on the carotid artery and gently press the tonometer down until you receive a consistent pressure waveform displayed on the data capture screen. When you have a minimum of 13 sec of consistent waveforms, click the OK button or (press on the footswitch, if used). Palpate the femoral artery pulse. This is located over the ventral thigh halfway between the pubic symphysis and anterior superior iliac spine. Place the tonometer on the femoral artery and gently press the tonometer down until you receive a consistent pressure waveform displayed on the capture screen. When you have a minimum of 13 sec of consistent waveforms, click the OK button (or press the on the footswitch, if used). The report(s) can now be reviewed. These measurements are typically conducted in triplicate. If the user wishes to measure the PWV between carotid and radial arteries, these steps just shown would be repeated except that instead of measuring at the femoral artery, the user would place the tonometer at the radial artery. To perform a measurement on a new patient, click on the Study button and repeat this procedure or use the Search feature to search for an existing patient. The software automatically saves all reports. To close the software, click on System from the main menu, and then click on Exit. Place the tonometer in the module tray for storage. Table 1. PWV results are produced in meters per second. In healthy subjects, these speeds can range from an average 6.2 m/sec (in subjects under 30) to 10.9 m/sec (in subjects 70 and older). 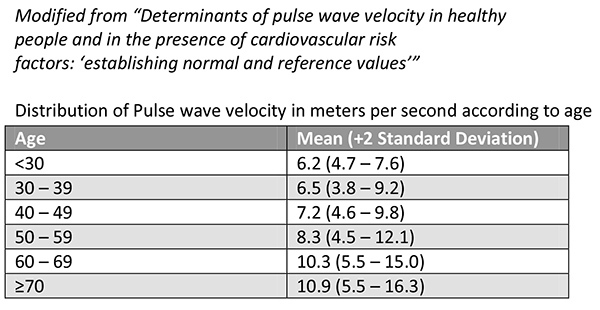 These values were established in the article "Determinants of pulse wave velocity in healthy People and in the presence of cardiovascular risk factors: 'establishing normal and reference values'" published in the European Heart Journal in 2010 (see Table 1). When performing the exam, the standard deviation must be under 10% in order for the results to be considered accurate. Figure 1. Carotid-femoral pulse wave velocity Waveforms. Waveforms from carotid and femoral arterial sites are displayed. The foot of each waveform and corresponding R-wave are marked to calculate the time delay. This information is displayed at the bottom of the page under the 'Pulse Wave Velocity Calculations' and the averaged result is listed below. In this example, the PWV is 6.0±0.3 m/sec with a standard deviation of 4%, representing a fairly consistent reading. Figure 2. Pulse Wave Analysis. The captured radial waveforms are displayed as well as the computer generated ascending aortic pressure tracing. 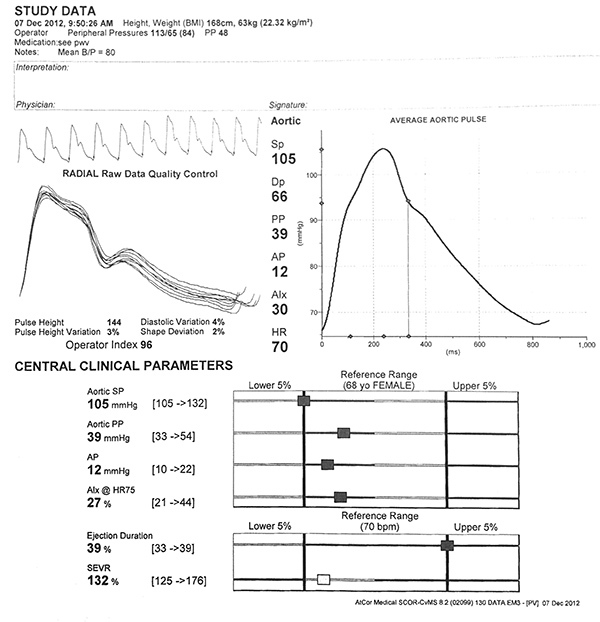 Information derived from this wave can be found under the 'Central Clinical Parameters' heading. The accuracy of the waveform is displayed in the 'operator index'. An operator index of 100 is desired however anything greater than 75 is acceptable. The measurement of pulse wave velocity (PWV) is a noninvasive method for analyzing central arterial stiffness in a relatively simple and reproducible manner3. 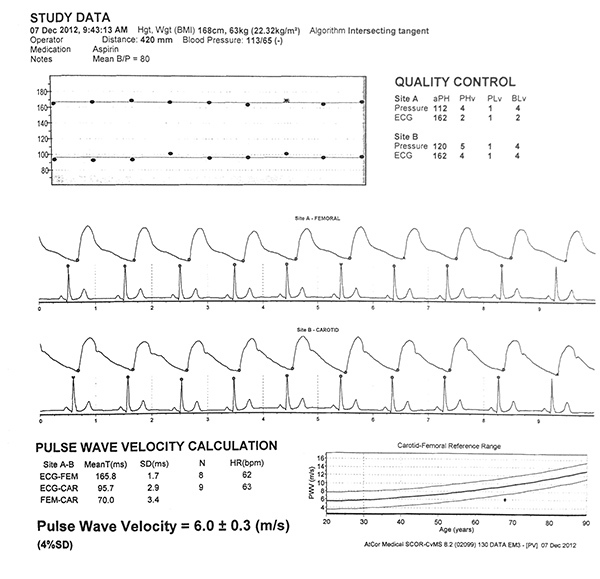 To assess PWV, the carotid (as a surrogate for the descending aorta) and femoral pulse waveforms are acquired using a high-fidelity tonometer; the time delay in pulse wave arrival at the between the two sites is estimated referencing to a concurrently recorded EKG waves by custom designed computer software that conforms to the propagative model of the arterial system3,10. The distance between these two sampling sites is then divided by this time delay to arrive at the "PWV"11. In addition to the assessment of arterial stiffness, the automated software can also estimate the aortic root pressure (which has a direct impact on the left ventricle) by evaluating specific aspects of the arterial waveform using "pulse wave analysis" (PWA)12,13. Alternative techniques such as echo tracking require a great deal of technical expertise and are more time consuming than the PWV. Echo tracking also generally utilizes video-image analysis and its measurements are therefore limited in precision3. While PWV is a relatively simple method used to acquire information about arterial stiffness, it does have several limitations and obstacles that need to be considered. In order to determine proper timing for analysis, the system utilizes the R-R interval from the EKG. If the subject has an unstable R-R (as with atrial fibrillation) or there is a significant difference in heart rate between measurements, the time delay cannot be assessed and the pulse wave velocity cannot be calculated. Accurate and consistently performed measurement of arterial length is an important part of this procedure. While any external measurement of a blood vessels internal path is at best an estimate, alternate approaches have been proposed to try and improve accuracy. While the "two distance input" method described above has been traditionally used by our lab and the labs of many leaders in the field, other potential approaches exist. One alternative is described in a recent Expert Consensus Document14 where 80% of the direct distance between the carotid and femoral sites is used. While the field continues to undergo a period of standardization and users should remain mindful of evolving guidelines, the length determination method described above remains the most common approach in the field at this time. Regardless of the approach, inter-patient consistency within a lab is a product of careful training and measurement and one potential obstacle to the inter-patient comparability of arterial length estimation is a difference in body habitus. Obesity can present challenges when locating the pulse, and make it difficult to measure the true distance between the carotid and femoral artery. Furthermore, as described above, determination of PWV involves dividing the time delay between the two pulse measurements by the distance between the two sites. It is, therefore, crucial to obtain an accurate distance measurement from the carotid to the femoral sampling sites. The abdominal fat contour can drastically alter this measurement by requiring the tester to lengthen the tape measure as they cross the distended abdomen, resulting in unreliable data. In order to avoid this issue, there are several accommodations that the tester can make in all of their studies to ensure direct comparability between individuals. It is best to take the measurement while the subject is in the supine position, thus allowing gravity to help flatten this contour. In addition to this, the use of a large wooden chalk board compass can be utilized to mark the sampling sites. The distance between the two calipers of this device can then be measured with a ruler. As this is a rigid tool that can be adjusted, the abdominal fat contour does not factor into the resulting measurements. A great emphasis has been placed on the role that arterial stiffness plays in cardiovascular disease though it is increasingly appreciated that other organ systems are affected as well3,15. Research is being conducted to correlate arterial stiffness with cognitive disorders, renal disease16, diabetes, and arthritis. Advances in the technique of performing PWV will serve to facilitate research in these areas by making measurements easier, less operator dependent, and improving reproducibility within individuals. A number of new products are coming on to the market that may aid this effort. One such device (SphygmoCor XCEL) uses a blood pressure cuff placed on the thigh in place of the standard tonometer on the femoral artery. A tonometer is still used to obtain the carotid waveform while the cuff simultaneously acquires the femoral pulse and the blood pressure. The transit time is then calculated directly as opposed to utilizing the EKG as a reference point in two separate waveform acquisitions. While this represents a significant change in methodology which will necessitate careful replicability studies to minimize method-dependent variability in longitudinal data, such changes may allow for a faster and less operator dependent method that will encourage faster adoption of this technique for the assessment of arterial stiffness in clinical as well as research settings. The authors declare that they have no competing financial interests. The authors received assistance with protocol description and performance of study from SphygmoCor which manufactures this product described. This research was supported by the Intramural Research Program of the NIH, National Institute on Aging and the Baltimore Longitudinal Study on Aging. A portion of that support was through an R&D contract with MedStar Research Institute. Standard protocol and technical expertise was provided by AtCor. Najjar, S. S., Scuteri, A., et al. Pulse wave velocity is an independent predictor of the longitudinal increase in systolic blood pressure and of incident hypertension in the Baltimore Longitudinal Study of Aging. J. Am. Coll. Cardiol. 51, (14), 1377-1383 (2008). Doonan, R. J., Scheffler, P., et al. Altered arterial stiffness and subendocardial viability ratio in young healthy light smokers after acute exercise. PloS one. 6, (10), (2011). Laurent, S., Cockcroft, J., et al. Expert consensus document on arterial stiffness: methodological issues and clinical applications. Eur. Heart J. 27, (21), 2588-2605 (2006). Mitchell, G. F., Hwang, S. -J., et al. Arterial stiffness and cardiovascular events: the Framingham Heart Study. Circulation. 121, (4), 505-511 (2010). Abbatecola, A. M., Chiodini, P., et al. Pulse wave velocity is associated with muscle mass decline: Health ABC study. Age. (2011). Watson, N. L., Sutton-Tyrrell, K., et al. Arterial stiffness and gait speed in older adults with and without peripheral arterial disease. Am. J. Hypertens. 24, (1), 90-95 (2011). Mackenzie, I. S., Wilkinson, I. B., Cockcroft, J. R. Assessment of arterial stiffness in clinical practice. QJM. 95, (2), 67-74 (2002). O'Rourke, M. F., Pauca, A., Jiang, X. J. Pulse wave analysis. Br. J. Clin. Pharmacol. 51, (6), 507-522 (2001). Stoner, L., Young, J. M., Fryer, S. Assessments of arterial stiffness and endothelial function using pulse wave analysis. Int. J. Vasc. Med. 2012, 903107 (2012). Farro, I., Bia, D., et al. Pulse wave velocity as marker of preclinical arterial disease: reference levels in a uruguayan population considering wave detection algorithms, path lengths, aging, and blood pressure. Int. J. Hypertens. 2012, (2012). Lakatta, E. G., Wang, M., Najjar, S. S. Arterial aging and subclinical arterial disease are fundamentally intertwined at macroscopic and molecular levels. Med. Clin. N. Am. 93, (3), 583-604 (2009). Ambrose, M. Clinical Manual (CVMS) Rev. 2, 1-51 (2011). Reference Values for Arterial Stiffness' Collaboration Determinants of pulse wave velocity in healthy people and in the presence of cardiovascular risk factors: 'establishing normal and reference values. Eur. Heart J. 31, (19), 2338-2350 (2010). van Bortel, L. M., Laurent, S., et al. Expert consensus document on the measurement of aortic stiffness in daily practice using carotid-femoral pulse wave velocity. J. Hypertens. 30, (3), 445-448 (2012). Scuteri, A., Brancati, A., Gianni, W., Assisi, A., Volpe, M. Arterial stiffness is an independent risk factor for cognitive impairment in the elderly: a pilot study. J. Hypertens. 23, (6), 1211 (2005). Khoshdel, A. R., Carney, S. L., Nair, B. R., Gillies, A. Better management of cardiovascular diseases by pulse wave velocity: combining clinical practice with clinical research using evidence-based medicine. Clin. Med. Res. 5, (1), 45-52 (2007). Posted by JoVE Editors on 05/08/2014. Citeable Link.